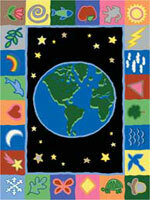 Here is a wonderful collection of kid themed area rugs. 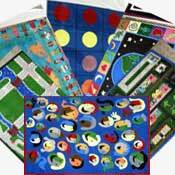 These kids rugs are excellent for play rooms, class rooms, daycares, nursery rooms, doctors offices, dentist waiting rooms, or any other area where children gather. They are all made from 100% nylon fibers and will wear well, giving years of enjoyment to children of all ages. 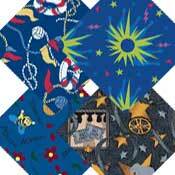 These kid rugs are available in a variety of sizes and shapes for any size area. If you have any questions, please give us a call as our sales staff are anxious to assist you in finding the perfect kids rug to fit your needs. 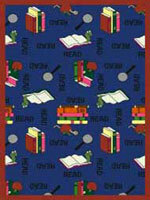 Kids educational rugs have become very popular for many reasons. Some rugs are bought to spice up and accent the room decor. Other rugs are used to give little ones a soft place to play on the floor with their toys. But beyond that, a kids rug can be a nice place to read a book with Mom or Dad or play games that are printed on the rug. Educational classroom rugs can also be used in daycares, church playrooms, and nurseries to help with abstract concepts, class themes, quiet time, and promote an better overall learning environment. 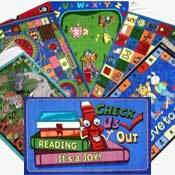 Kid's rugs and Educational Rugs come in many themes ranging from reading to colors, numbers and geography, and many others. 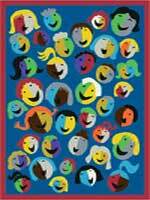 Call 1-800-626-6936 and give your child or classroom a great new rug to play on that also helps them learn!